No matter where you are in life, you will eventually need to plan for your old age. Some Floridians get a jump on it early by planning for their children while in their mid-forties, while others come to us because they are worried about losing their life savings to pay for increased medical costs. But the most important factor in estate planning may not be your age—it is how to protect your home and wealth from taxation, debt collectors, and other forms of depletion. In many cases, families can benefit greatly from placing their assets in a trust—that is, transferring cash and property out of their own hands and having it held for their families. Most estate planning attorneys advise using a revocable trust, which can be revoked or amended at any time, allowing you to take your property back. However, under certain circumstances, an irrevocable trust may be a better option. Normally, when a person passes away, the government requires that tax be paid on all of the person’s assets and holdings (everything in his or her name). An irrevocable trust removes all ownership of the deceased person’s assets, making everything in the trust estate tax-free. In addition, by naming the trust as your beneficiary, the assets in trust will not be counted as part of your spouse’s estate, saving him or her from paying estate taxes on them upon his or her death. Many people are concerned about how their wealth and holdings will be distributed after they die. Rather than simply write their wishes in a will or give money away during their lifetime, a trust allows them to maintain control over the distribution of their cash and assets. Trusts allow you to set the amounts of inheritance, as well as create timing and restrictions for their distribution. For example, if you want to provide for a family member but do not want his parents to be able to access the money, you may stipulate that he cannot receive the amount until he is 21 and can use it for educational purposes only. An irrevocable trust can also prevent creditors from taking your family’s property for payment of debts. As the assets in the trust no longer belong to you, they cannot be taken from you if you fall on hard times or need ongoing medical care. In addition, any debts owed by your trust’s beneficiaries cannot be collected from assets in trust until they are officially distributed to the beneficiary. You Only Have One Chance at Creating Your Irrevocable Trust! As this trust cannot be amended once it takes effect, it is vital that you have an experienced estate planning attorney advise you on every step of the process. Many seniors have made serious mistakes when drafting their trust agreements, such as failing to choose a reputable trustee, failing to stipulate how the money is to be used while it is held in trust, and failing to address common distribution problems (such as if a beneficiary dies or remarries). In addition, there are many other tax implications you must consider before creating your trust. While most trust assets are exempt from estate tax, you may be liable for gift tax if you transfer too much at one time, so you must be careful to stay within tax exemption limits if you want to minimize your tax liability. 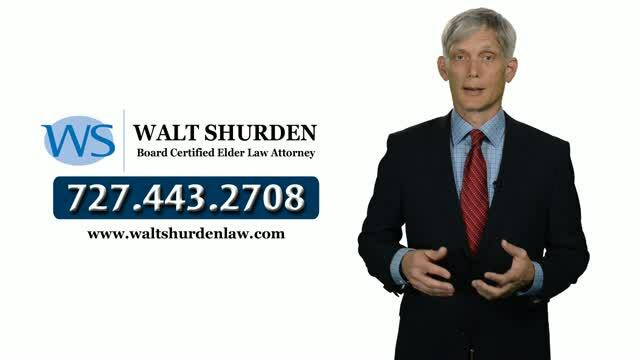 At Walt Shurden Elder Law, we can help you draft your irrevocable trust, decide which items should be transferred and when, and help you choose a reliable trustee to manage your assets. As specialists in elder law, we are committed to helping seniors make financial decisions that benefit them, rather than ourselves. Call our Clearwater office today at 877-241-1230 or email us to begin planning for your future.